My life was carrying along. My daily exercise was just walking on the treadmill in the gym for an hour although I followed a strict diet. But, my biggest flaw was that I used to sleep only for 3-4 hours a day. The result of this bad lifestyle was I was obese and weighing 138 Kgs with a 48-inch waist size and my shirt size was also 48 inches. If this wasn’t enough, in June 2016, I was diagnosed with diabetes (252) and that is when the alarm bells rang and I was worried. I had to rectify my habits and my lifestyle if I had to lead a medical free and healthy life. I immediately started with some activities on my own. I started going to the gym and walk on the treadmill. I was only resorting to cardio exercises and ignoring the other aspects of fitness. I had no guidance coming my way so I was not sure if I was doing the right thing. I wanted to start doing the right things. I began with searching for a fitness band and came across many products. Then I came across GOQii. What I liked about GOQii is that it was just not a fitness band but the subscription included free personal coaching. The personal coach would guide you on fitness and nutrition. GOQii went out of the way to ensure healthy habits are imbibed by the users. I found that very appealing and chose GOQii. I am very fortunate to have got Falguni Kotak as my coach. Falguni, clearly understood my goals (weight reduction and to get fit) and started advising very relevant habits. Earlier, when I had started going to the gym I was only focused on the treadmill but, she refined that and added strength exercises and core workouts. Also, she emphasized the importance of proper deep sleep and its advantages. Gradually, the habits set in. It’s not possible to change yourself in a day. With concentrated efforts and discipline, I am now able to sleep well for seven hours a day. Also, I do proper well-balanced cardio, strengthening and core workouts. My water intake has improved and I regularly take at least two litres of water a day. 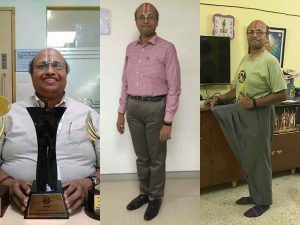 All these positive habits helped me to sustain my efforts and make it a habit for a lifetime. 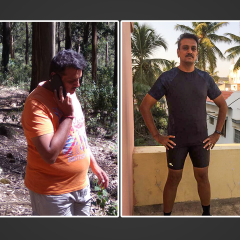 My strict diet (prescribed by my Doctor) followed with proper exercises helped me to reduce my weight (50 Kgs and both trousers & shirts reduced by 10 inches) and the habits imbibed because of Falguni & GOQii helps me to sustain that. With these lifestyle changes for the better, I feel very good and positive about myself. 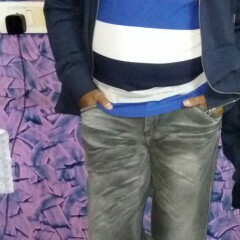 My goal is now to reach a weight target of 75kgs. I cannot think enough my coach and also GOQii. 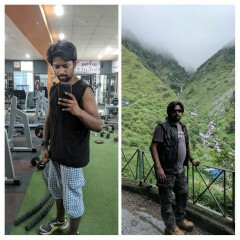 The best part of having been on GOQii is that I have earned karma points to be healthy. And, these points I have been donating to charity. So I am doing my bit for the society as well. Which otherwise we seldom do. I have been maintaining a streak of 211 days (of walking more than 12000 steps each day) and this helped me to earn good amount of Karma points. Apart from being self-motivated and having a coach to further amplify that motivation, the other big motivating factor is earning Karma points. Whenever I walk someone who may be underprivileged or having health issues gets the right treatment or support for food or education. What else is required to get motivated to move on to be healthy? Among the other brands who just sell the band, GOQii focusses on mind, body and soul through physical fitness, meditation, and Karma points. 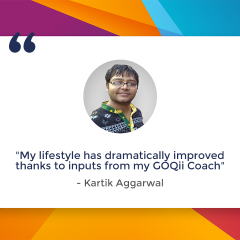 Apart from that the GOQii dedicated coach who understands the unique challenges of individuals and guides them properly to achieve their fitness goal. The personal touch and doing good to society at large makes GOQii the unique product and service. What does the coach Falguni Kotak have to say about her player Vijayakrishna Iyengar? Vijayakrishna was very determined and motivated when he came on board. I am really impressed by his sincerity. He always tried to do more than target step count and never missed his workout. In the last six months, along with cardio exercises, we also worked on doing core workouts and strength training. Now, he has also started slow jogging. Sleep duration and quality improved by avoiding electronic gadgets before bedtime and going to bed by 10:30 pm. I am sure he will achieve his goal to be in normal BMI soon. Seeing him motivated motivates me too.